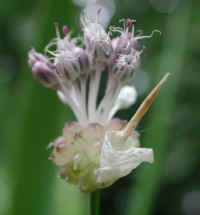 (Garlic, Field (Allium vineale) - 01) Field garlic can grow to heights of four feet when left undisturbed. 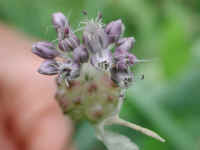 Their long, rounded, and hollow leaves spring up from the ground in early spring, and by mid to late spring, they begin to develop flower buds, like this one. 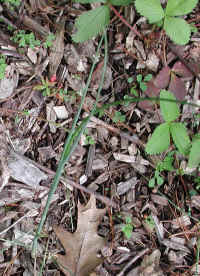 (Garlic, Field (Allium vineale) - 02) This field garlic plant is growing up through some wood chips with some wild strawberries. The roundness of the grass-like leaves is helpful in identifying field garlic from wild garlic which has flatter, solid leaves. 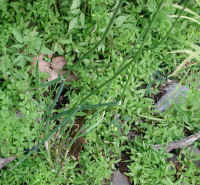 (Garlic, Field (Allium vineale) - 03) This field garlic in this photo was over three feet tall, which is another way to distinguish the field garlic from wild garlic, as wild garlic reaches a maximum height of about two feet. 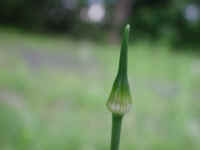 (Garlic, Field (Allium vineale) - 04) This is another look at the cone-shaped flower bud of the field garlic. 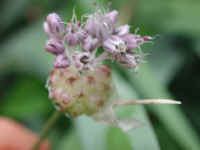 (Garlic, Field (Allium vineale) - 05) When the field garlic is ready to bloom, the "cone" of the bud dries up and falls off leaving a berry-like cluster; the flowers grow from the top of the cluster. 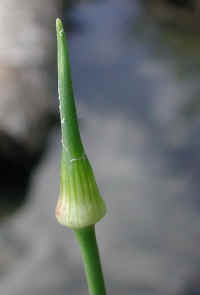 (Garlic, Field (Allium vineale) - 05a) According to the literature, field garlic can have two types of flowers: these tiny (less than 1/8 inch) bulb-like flowers, or open flowers. We found no scientific naming difference between the two, which seemed strange. Each flower grows at the end of a stem and has three sepals and three petals of the same size and color, six stamens, and one pistil. 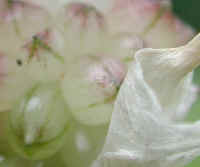 There are additional filaments growing from the bulb-like flowers which we could not account for. (Garlic, Field (Allium vineale) - 06) In this side view photo, we can see the way the tiny flowers grow from the top of the berry-like cluster. We can also see the dried up "cone" still clinging to part of the cluster. 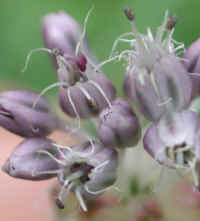 (Garlic, Field (Allium vineale) - 06a) This is a close up look at a portion of the the field garlic berry-like cluster. (Garlic, Field (Allium vineale) - 07) Field garlic is a member of the Lily family (Liliaceae). 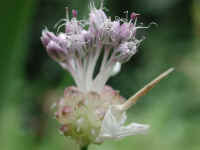 Field garlic blooms from May until July, and can be found in fields and along roadsides. 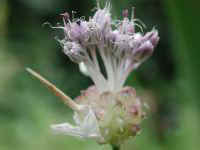 We also have found it growing along the edge of the lake. (Garlic, Field (Allium vineale) - 08) This is another look at the field garlic flowers.